AN AIRBUS jet, a sprawling private university and an Indian premier league team are just a few things India's wealthiest man can boast about owning himself. 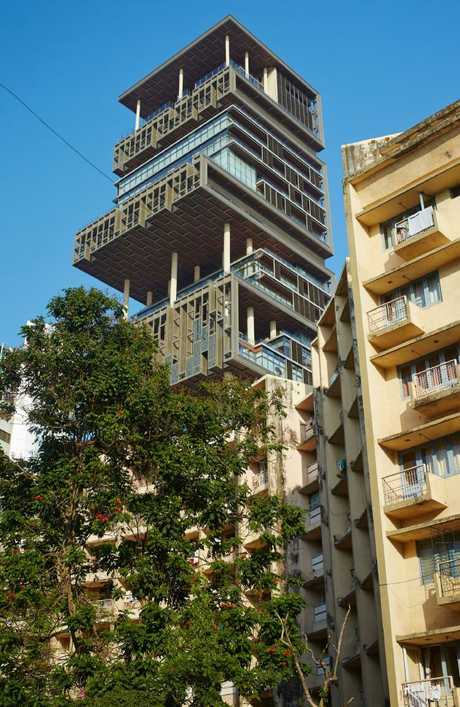 But it's Mukesh Ambani's 27-storey home, the world's first apartment to cost more than a billion dollars and the world's largest single-family home, that constantly gets tongues wagging. 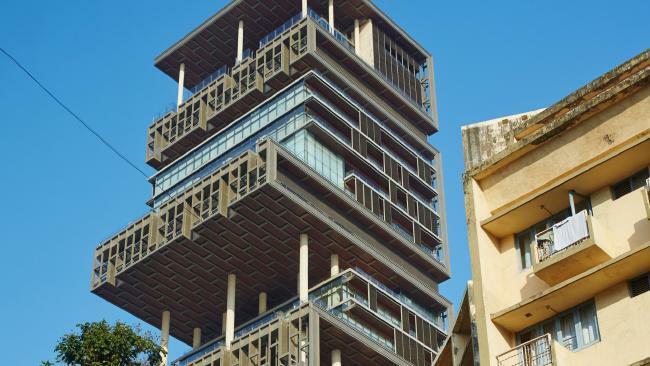 In 2002, when Ambani lost his father to a stroke, the billionaire businessman began to consider building a home for his wife and three children in their hometown of Mumbai. 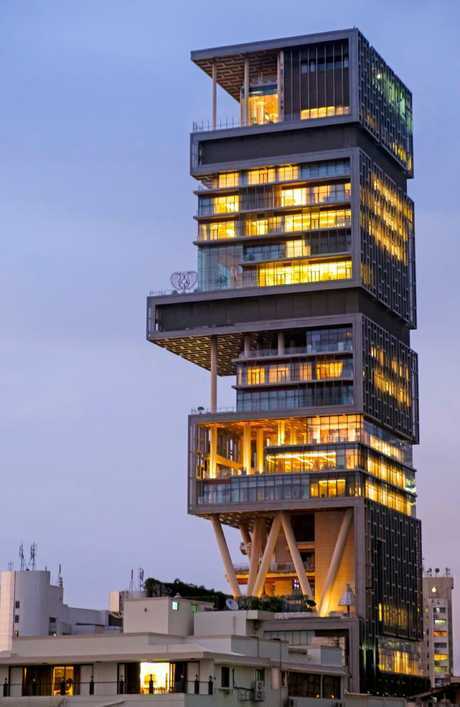 Six years later, the 61-year-old dipped into his fortune and started construction on Antilia, a 27-storey apartment in the heart of Mumbai, on one of the world's priciest streets. 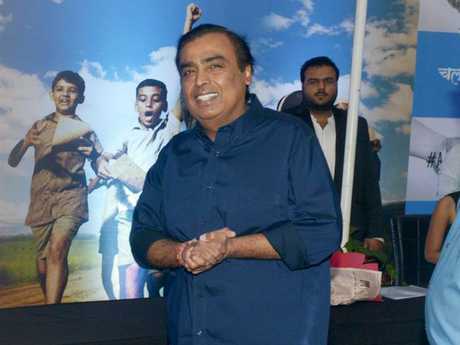 Since taking over as chairman of Reliance Industries, Ambani has sat comfortably at the top of India's rich list and as of July was worth $US45 billion. His father Dhirubhai Ambani was the ultimate rags to riches story in India, starting a humble materials business that the family later turned into the world's biggest producer of polyester fibres and yarns. Today, Reliance Industries is responsible for almost a fifth of India's exports. Antilia, while it was being built. 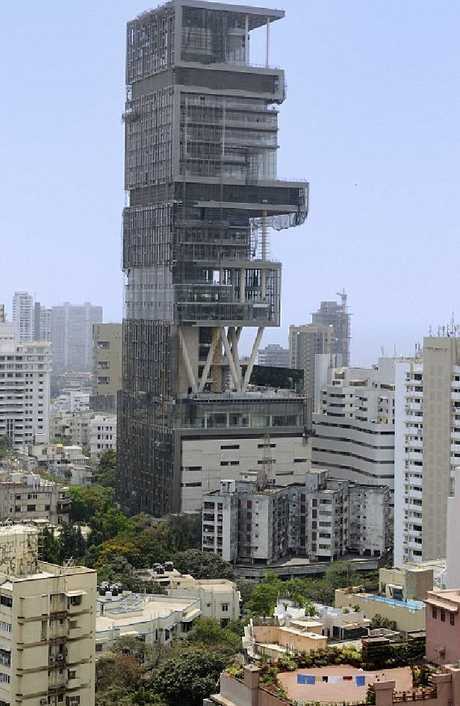 Ambani, his wife Nita and their three children Anant, Akash and Isha have lived in the home since 2010 which, at the time of being built was considered the most expensive residence in the world. 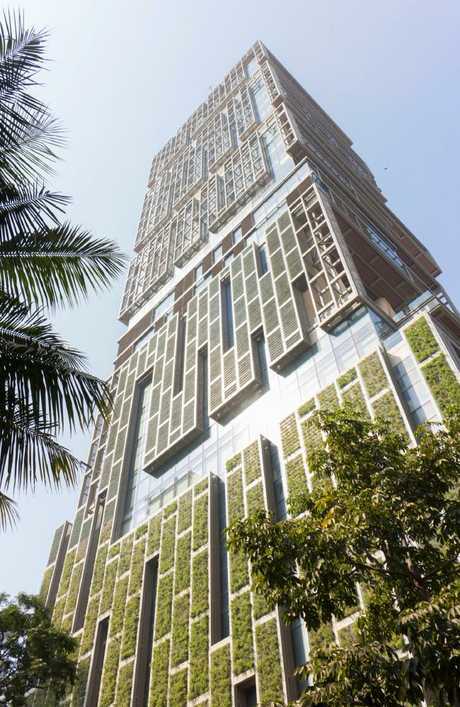 The sprawling, glass-covered building stretches more than 150 metres into the Mumbai sky, towering over the city's 20 million residents and well above the smog the city is known for. In 2012, Nita invited Vanity Fairinto the home, showing off Antilia's lush, multi-level gardens, stunning water features and their three helipads perched on the roof. It's all maintained and kept clean by over 600 staff, 24 hours a day, but when the kids come home from studying across the world, they're still made to clean their own rooms. "It's a modern home with an Indian heart," Nita told Vanity Fair. "We made our home right at the top because we wanted the sunlight … so it's an elevated house on top of a garden." The only residential property that's technically more expensive is Buckingham Palace but because the British royal family's home is Crown land, the Ambanis hold the number one title. "This is a gated community in the sky," author Gyan Prakash told the New York Times in 2010. 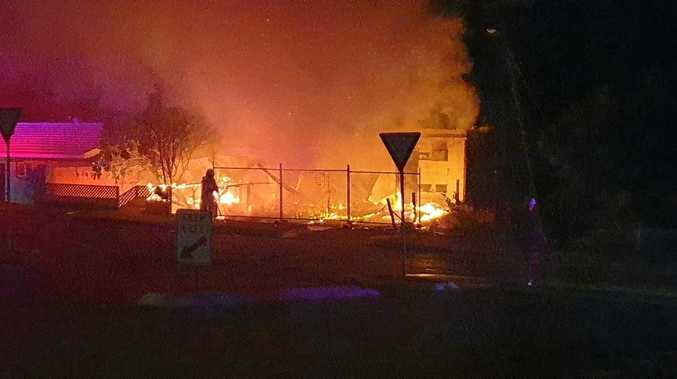 "It's kind of returning with a vengeance to where they made it into the middle class and trumping everybody," Mr McDonald told the New York Times. "He's sort of saying, 'I'm rich and I don't care what you think.'" But the Ambani family doesn't just live in luxury in Mumbai. When Ambani needs to leave his beloved home in India, he jumps on the family's private Airbus and flies to wherever he has to go. Despite their exorbitant lifestyle, the Ambani children remain firm on wanting to give back to their country. Isha Ambani, 26, a recent Yale graduate, said she knows she holds the future of India in her hands. "All my life, I've seen my family dedicate themselves to growing Reliance and improving quality of life for all Indians. I feel a sense of responsibility towards the company and my country. I truly believe that helping to grow Reliance is my dharma," Isha told Vogue in July 2017. "My best role model is my father. Because of him I believe fearlessness is a virtue. He raised me to believe I could achieve anything if I am courageous, hardworking and self-confident. He taught me there is no glass ceiling. His patriotism to India and his passion for the potential of the youth of this country is truly inspiring."